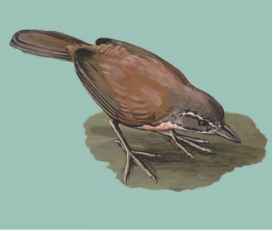 Physical characteristics: The rusty-belted tapaculo is one of the larger tapaculos. They are about 7.5 inches (19 centimeters) long and weigh about 1.5 ounces (42 grams). Rusty-belted tapaculos live on the forest floor. Their dark gray-brown back helps them blend in well with their environment. Their throat and breast are white, with a rusty reddish breast band that gives them their name. They have a black, white, and rusty pattern on their undersides. Geographic range: Rusty-belted tapaculos live in South America in southeastern Colombia, western Brazil, and neighboring parts of Peru and Ecuador. Habitat: Unlike many tapaculos that prefer higher, cooler elevations, rusty-belted tapaculos live in humid lowland rainforests on the forest floor. Diet: Like all tapaculos, these birds eat insects. They feed by walking or hopping slowly along the forest floor looking for prey. Behavior and reproduction: Rusty-belted tapaculos build underground nests among the roots of trees. Little is known about their reproductive behavior, because they are shy and difficult to observe. Rusty-belted tapaculos and people: These birds have little interaction with people and are rarely seen. They are of interest mainly to ornithologists and birdwatchers. 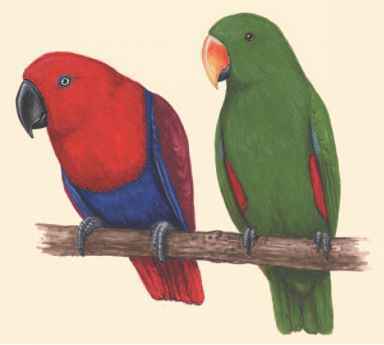 "Birds, Mammals, and Amphibians of Latin America." NatureServe. http://www.natureserve.org/infonatura (accessed on May 4, 2004).